The scholarships listed below are offered to UCHS seniors. The 2019 Scholarships will be presented at the UCHS Senior Awards Ceremony, Tuesday, June 4, 2019. The application deadline is Monday, April 8, 2019, 2:30 pm. Please read the instructions on How To Apply for forms and information. 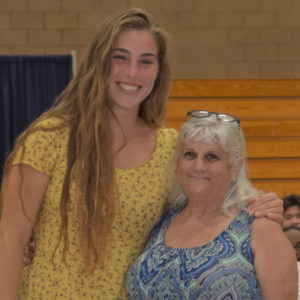 This scholarship is offered in memory of and to honor Mrs. Thalia Murray, who taught in the San Diego Unified School system for 20 years, including 17 years at Marcy Elementary (now Mission Bay Montessori) in U.C. She received a scholarship that allowed her to attend a high-quality, 4-year college, which dramatically changed her life for the better. By working closely with a committee comprised of key EdUCate! Board members, our goal for this scholarship is to have a similar impact. This Scholarship is awarded each year to one eligible senior at University City High School in the total amount of $2,000. 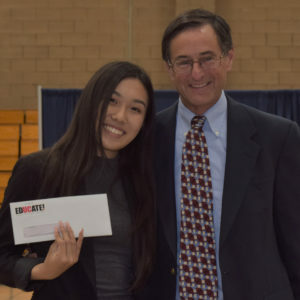 Congratulations to Rachel Luu, recipient of the 2018 Thalia Murray Scholarship. For more information on how to apply click here. The Sonnenberg family and Sonnenberg CPA firm offered two $2,000 scholarships in 2018. The scholarship offers assistance to UCHS students pursuing a business-related career at a 2 or 4-year college. 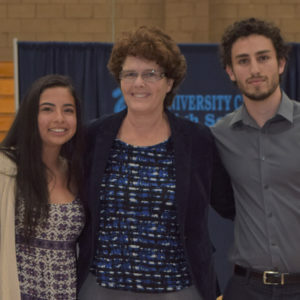 The Sonnenbergs recognize candidates having a GPA of 3.0 or higher that have shown a combination of achievement that includes outstanding citizenship, volunteerism, school involvement, athletics and/or financial need. This year, the scholarship was awarded to two male students. Congratulations to Johana Chavez and David Glukhov, 2018 Sonnenberg scholarship recipients! For more information on how to apply click here. This scholarship was funded by donations in memory of Ray Perkins, a UCHS teacher in the Science Department who passed away January 27, 2012. Congratulations to Emily Heinz, recipient of the 2018 Ray Perkins Memorial Scholarship in the amount of $500. This scholarship is offered by the Board of Directors of EdUCate! 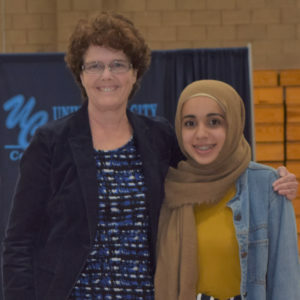 University City Foundation for Public Schools to recognize two UCHS students for the spirit and practice of volunteerism in our community. Congratulations to the recipients of the 2018 EdUCate! Volunteer Service Scholarship in the amount of $500, Sidrah Albahsahl for volunteering with Syrian refugees and Andre Domingo for volunteering at the Veterans Administration.